This Ramadan, Sunway Resort Hotel & Spa celebrates a vibrant mixture of flavours and aromas at The Resort Café, featuring indoor and outdoor bazaar-style stations with live-action cooking from the chefs, reminiscing the classic bustling atmosphere of the Ramadan bazaar found around Malaysia during the festive period. Diners are in for a culinary treat with a multitude of nostalgic and new mouth-watering recipes to entice and revitalise the palate, alongside the many must-have recurrent dishes, served on the nightly buffet dinner at 6.00pm to 10.30pm from 17 May to 14 June 2018 at The Resort Café, Sunway Resort Hotel & Spa. Leading the brigade of over 40 chefs for the season is Malaysian Chef Mohamad Yatim, Sous Chef Tournant of The Resort Café. Chef Yatim who has over 20 years of experience working in local and international hotels, will be cooking up a storm of over 400 timeless dishes for 29 delicious days. Diners can anticipate an energetic ambience with enticing aromas filling the air as the restaurant is transformed into a vibrant Bazaar-style atmosphere for a true feast of the senses. Taking centre stage are nine (9) main food categories which are the Nasi Station featuring 15 varieties of rice cooked in different styles including a must-try for the season – Bamboo Briyani, the Bakar Station where fresh meat and seafood will be grilled on the spot for diners, the Soup Station including the restaurant’s signature Soup Gearbox Turbo, the Golek Station featuring a whole Roasted Goat, the Noodle Station serving a wide variety of soup and gravy based noodles, the Kawah Station where super-large cauldrons containing rich and spicy Gulai awaits, the Ulam-Ulaman Station offering an assortment of over 20 local picks as well as pickled fruits (jeruk) which can be enjoyed with the wide selection of Sambals, the Goreng Station will have fried Malaysian and Middle Eastern snacks and lastly, the Dessert Station which will feature a wide range of Durian specialities as well as traditional favourites. The Resort Café, located at the Lobby Level of Sunway Resort Hotel & Spa, will commence the special Ramadan buffet dinner nightly from 17 May to 14 June 2018, starting from 6.30pm to 10.30pm. The buffet is priced at a special promotional price at RM98 nett per adult from 17 until 23 May and 11 June to 14 June 2018; whereas the buffet is priced at its normal price at RM178 nett per adult, RM108 nett per senior citizen and RM98 nett per child (aged between 6 to 12 years old) from 24 May to 10 June 2018. 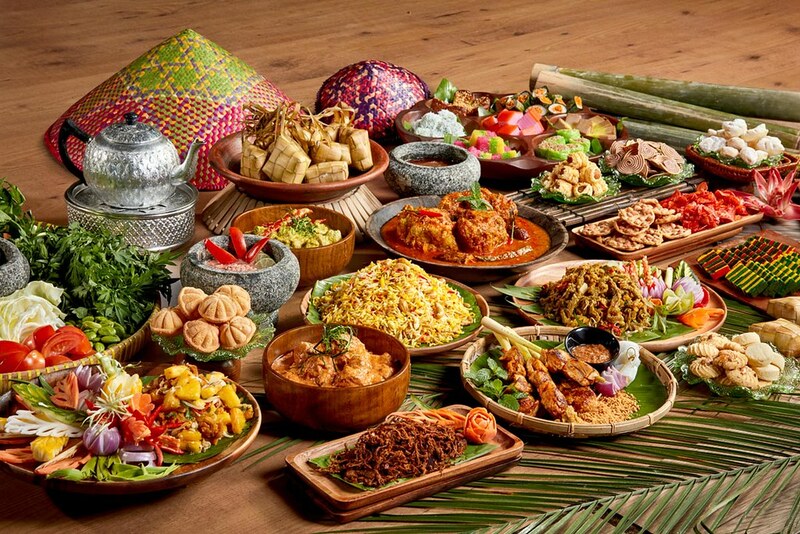 Inspired by the proverbial invitation and expression “Jemput Makan”, diners are invited to immerse themselves into the bustling energy of The Resort Café, and be enticed by the interactivity, aromas and flavours of the nostalgic and traditional dishes from Malaysia and around the region. This year, alongside the many favourite perennial dishes and specialities The Resort Café is known for, the team of chefs are introducing a fusion of timeless and classic recipes to entice and rekindle the palate. A key highlight this year are the outdoor stalls called “Bazaaria TRC” – diners are invited to step outside the restaurant where a bustling Ramadan Bazaar-like concept of live action stations awaits, filling the air with enticing aromas. The main highlights during Ramadan season this year are featured into nine (9) main categories. 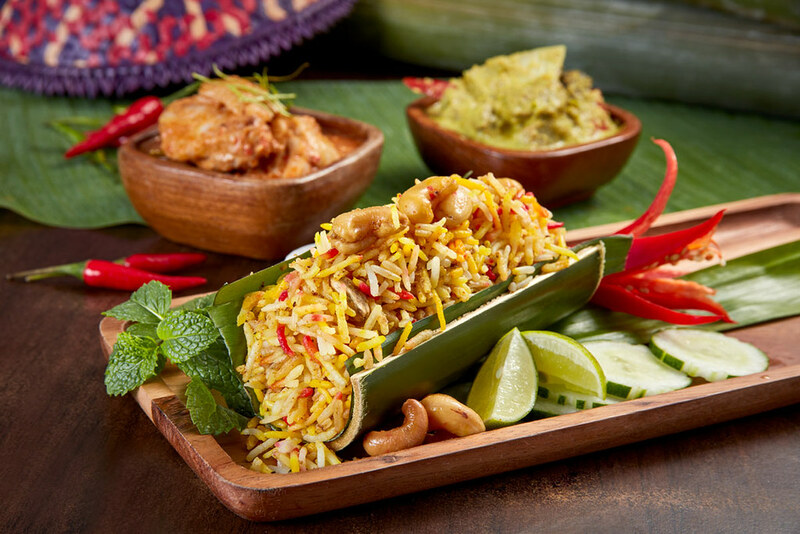 The Nasi Station features 15 varieties of speciality rice dishes with the must-try for the season, the Bamboo Briyani – a fascinating dish to many Malaysians for the way it is prepared and the flavourful taste owing to the cooking method. Briyani Rice together with some meat and vegetables are inserted into a bamboo tube that has been layered with banana leaves, which are then cooked over charcoal fire, giving it a delicious smoky aromatic flavour. The other speciality rice dishes on the buffet rotation include the Nasi Bukhari, Nasi Hujan Panas, Nasi Briyani Gum, Nasi Tomato, Nasi Kunyit Ayam, Nasi Minyak, Nasi Bukhara Buah Gajus, Nasi Ulam, Nasi Minyak Nenas, Nasi Beringin and a selection of Middle Eastern preparation like the Nasi Mandi, Maqluba, Kabsa and Egyptian Kushari. One of the key highlights on the buffet which complements the variety of rice is a popular dish in both Melaka and Johor, the Ekor Asam Pedas, a delicacy that many enjoy. 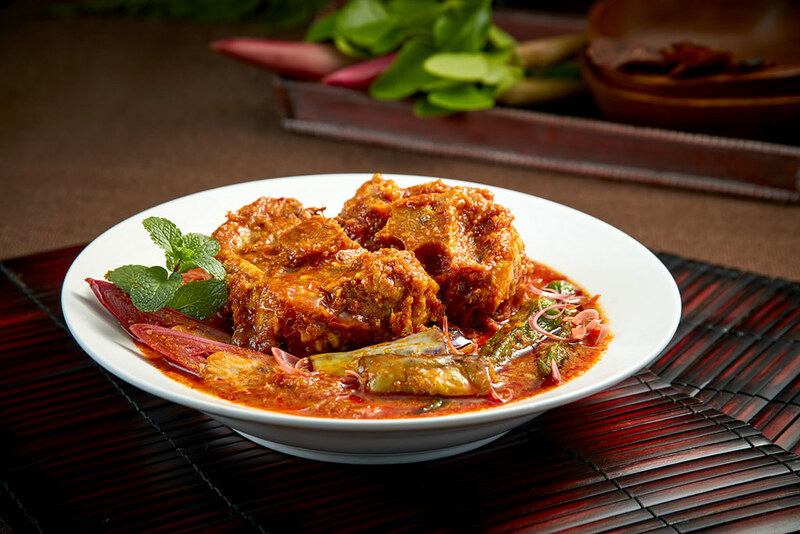 Our chefs’ home-made version is a dish encompassing Oxtail in rich mouth-watering Asam Pedas Gravy, the right combination of both spiciness and sourness, added with fresh tomatoes and lady’s fingers to give it more depth. Under the Soup Station, The Resort Café’s Sup Gearbox Turbo is back by popular demand and continues to be the restaurant’s must-have dish this year. This favourite dish is cooked over a slow fire for eight (8) hours and individual bone marrow which is the prized ingredient of this dish is served to diners from a large cauldron, providing diners with a visual feast and aromatic treat. Other soup varieties that diners can look forward to include the Soto Ayam, Tom Yam, Sup Campur and Lentil Soup. At the Bakar Station, which will be located outdoors, fresh marinated meat like Chicken, Beef, Lamb and seafood like Fish – Ikan Pari, Kembong, Siakap and Selar – Squid, Prawns, Kupang, Clams and more will be grilled a la minute by the chefs. 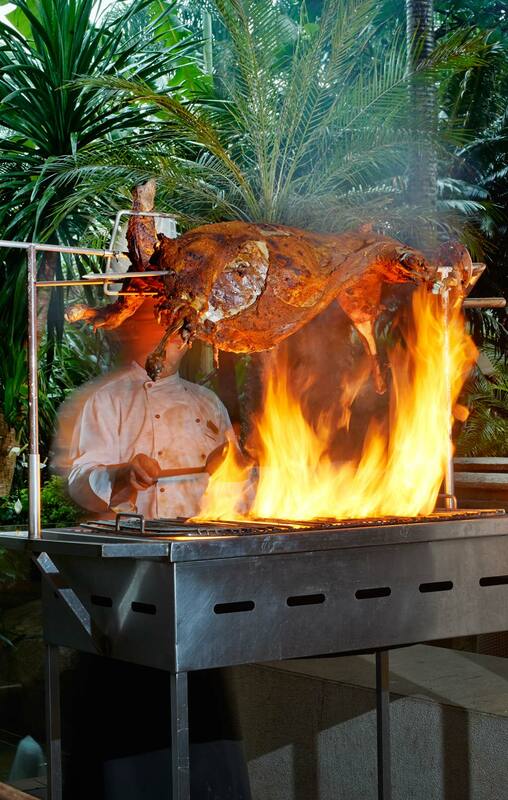 The Golek Station will feature a whole Lamb, where the chefs will slice the succulent meat directly unto the diners’ plate. The Lamb is marinated overnight with almost 25 different local spices and mixed herbs such as old ginger, garlic, lemongrass, galangal, salt, masala, coriander, yoghurt, mint leaves and cumin powder before slowly roasting for four (4) hours to retain its moisture, producing a tender and juicy meat for diners to enjoy. Noodle lovers are also in for a treat with a wide variety of soup and gravy based noodles at the Noodle Station which includes the Mee Rojak, Mee Bandung Sumatra, Nyonya Laksa Lemak, Laksa Johor, Prawn Mee, Dry Wonton Mee and Pan Mee. Here, diners are able to select their own choice of noodles where the chef will then blanch it in boiling water before pouring the hot flavourful broth and topping it with fresh garnish. The Kawah Station features a selection of Gulai Kawah that will be served outdoor in super-large cauldrons. With a selection of two (2) Gulai Kawah served nightly from eight (8) rotational varieties, the list of Gulai Kawah comprises of Gulai Utara Ikan Dengan Bendi, Gulai Tulang Rawan, Gulai Ketam Dengan Nenas, Gulai Ayam Lengkuas, Gulai Ayam Pedas, Gulai Nangka pedas, Gulai Ayam Bersama Kentang, Gulai Ikan Kembung Gulai Ikan Merah, Gulai Sotong Cili Hijau and Gulai Kambing Bagar. The Ulam-ulaman Station will have an assortment of over 20 local picks like the Kacang Botol, Petai, Daun Selom, Pucuk Ubi, Daun Pegaga, Ulam Raja, Jering, Jantung Pisang as well as pickled fruit (jeruk) which can be enjoyed with the wide selection of Sambals and some Asian home-made dressings. Kerabu will also be a highlight in this station with authentic selections like the Kerabu Pucuk Paku, Kerabu Jantung Pisang and Kerabu Ulam Raja. 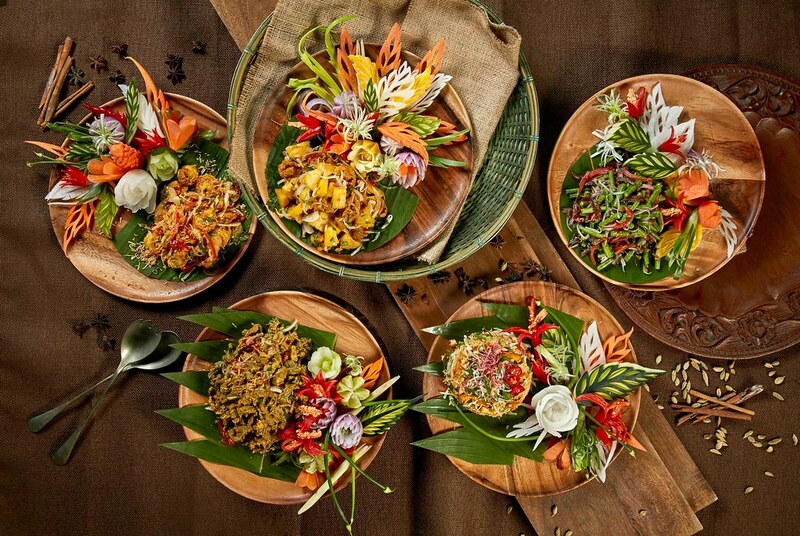 Each day will also see a rotation of favourite Asian salads such as Pasembur, Gado-gado, Miang Kham, Som Tam, Pecal Jawa and Rojak Buah. The Goreng Station will feature some of Malaysians favourite tea-time snacks like the Goreng Pisang, Cempedak Goreng, Keropok Lekor, Karipap, Ubi Goreng and much more. Diners can also look forward to sampling a range of Arabic snacks such as the Kibbeh, Falafel, Sambousek and Brik. 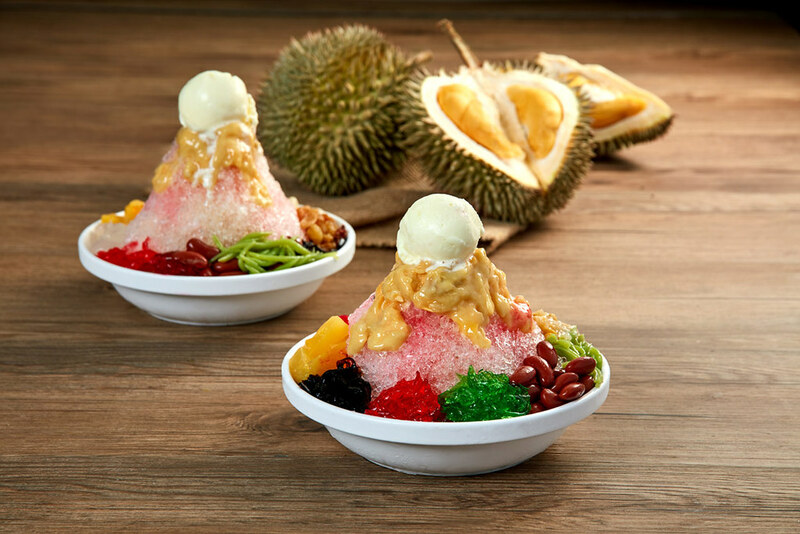 The dedicated Dessert Station is a must stop for diners; especially for durian lovers where a wide range of durian specialty desserts like the Durian Ice Kacang, Durian Cheesecake, Durian Cake, Pengat Durian, Durian Smoothie, Durian Pudding, Durian Wajik, Durian Pulut, Durian Pizza and Durian Ice Cream will be available amongst the desserts; including trays of home-made Malay and Nyonya desserts; an assortment of agar-agar, pudding and bubur. Sarawak cake lapis will be featured on the buffet with its amazing layers and colours, an assortment of raya cookies with batang buruk, kuih siput, kuih bangkit, kuih rose, kuih karas, kuih semperit, kuih kapit, dodol; and favourites like kuih Bingka @ Bangkang like bingka ubi kayu, bingka labu, bingka roti, bingka pandan, bingka tepung and bingka kelapa. The Resort Café will serve its Ramadan buffet dinner nightly from 17 May to 14 June 2018, starting from 6.00pm to 10.30pm. The buffet is priced at a special promotional price at RM98 nett per adult from 17 until 23 May and 11 June to 14 June 2018; whereas the buffet is priced at its normal price at RM178 nett per adult, RM108 nett per senior citizen and RM98 nett per child (aged between 6 to 12 years old) from 24 May to 10 June 2018. FOR DINNER RESERVATIONS at The Resort Café, please call +60 3 7495 2009 / +60 3 7492 8000 or email to srhs.trc@sunwayhotels.com to secure preferred seats and/or tables. Advanced reservations are encouraged. FOR DINNER RESERVATIONS or special dinner arrangements at The Resort Café, please call directly at Tel: +60 3 7495 2009, +60 3 7492 8000 or email to srhs.trc@sunwayhotels.com to secure preferred seats and/or tables. Advanced reservations are encouraged.